For the past 30 years Keepings Coaches has been providing transport for students and pupils to and from educational establishments. Each day Keepings Coaches safely transports around 1000 students and pupils to and from school and college. 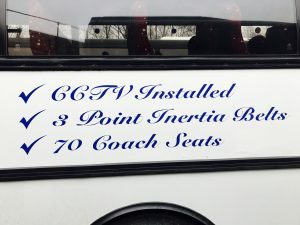 All of our coaches are fitted with 3 point inertia seat belts and CCTV in order to provide the safest environment for student transport. All of our drivers have undergone Criminal Records Bureau (CRB) checks and training in areas such as CPC courses, Emergency First-Aid and Special Educational Needs (SEN) courses.